Thirteen years ago, I was reading a Woman’s World magazine, and one article changed my thoughts on how many children is “enough.” At the time, I thought three was plenty. My kids were ten, seven, and five. I was homeschooling them, and we had a very busy life. Then I read an article about all the girls growing up in orphanages in China. I wept when I read the article and realized my heart had room for more. That night after dinner, I showed John the article and brought up the idea of adoption. At the time, John wasn’t interested. “These three are a handful. How can we deal with more?” Then there was the thought of cost. Adoption was (is!) expensive. I was disappointed, but I let the matter drop. I’ve learned over the years that nagging never works, and if God desires John’s heart to change, then He’ll do the change. It took almost three years for us to fill out the paperwork for a Chinese adoption … just in time for the wait for a Chinese baby to greatly increase. We still don’t have that beautiful little Chinese girl I felt called to add to our home. We’re still waiting, and we know that the child God chooses to bring into our home in this way is going to be pretty special. And, like the way God works, there have been other surprises along the way. You see, a few Decembers ago I was extremely discouraged. Why did God place this on my heart … and why did it take so long for John to get on board … only to have everything slow down in China? I didn’t understand. After crying and praying about it, I finally had peace. God (not me!) had a perfect plan. I relinquished all my ideas and dreams to Him. I told Him I trusted Him and I was willing to wait. It was that very same day that I got a call from a friend telling me about a birth mom in our own town who was looking for an adoptive family. John and I soon met with this amazing young woman, and we realized that God had a different gift for us than we expected. Our baby girl was born in March 2013, and she has been an amazing gift to us! When we hold, hug, kiss, and play with Alyssa, we are filled with joy. She brings joy to our lives, but there’s also joy knowing that even though God’s plans are different than ours … in the end, they are beautiful. Looking back, I’ve come to learn God’s timing is perfect. We just need to be willing to trust Him, wait, and be open to the children He has planned for our families. Tricia, what a sweet story! Yes, everything happens according to God’s plan and timing. And the waiting phase is difficult. But oh, the joy that comes afterward! Loved hearing your story, Tricia. 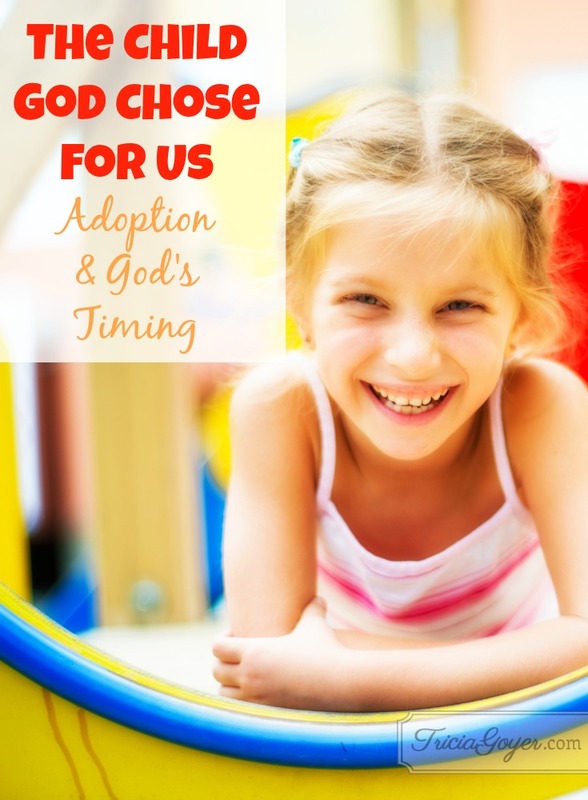 After 11 years of marriage, and 8 months after a hysterectomy, God made a rainbow of my tears and filled my empty arms through a young lady who chose an adoption plan. Having not filled out one form with the particular agency she chose, we suddenly received a call and were told we could be parents in 5-7 weeks due to the desires of our son’s birth mother. What a thrill! Only God could have done that. Our young man is 30 now. Yes, God’s timing is perfect. That’s an amazing story, Judy! Thank you so much for sharing it! Thanks so much for this story! I love to hear about a successful adoption. As great as it is to hear this story, though, I’m excited for the day when you get to tell this story to your daughter. It’ll show her your love and will stay with her for her entire life. Thanks for sharing! I am glad that your husband finally decided that adoption was a good choice. Even though it has taken longer than you thought, it’s still fantastic that you are going to be raising a young Chinese girl. I think adoption is such a great thing, especially when those babies don’t have anyone to care for them.